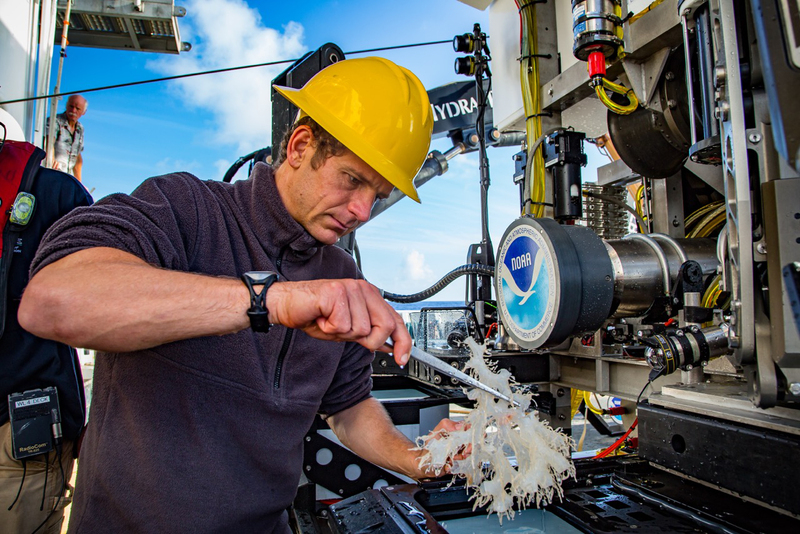 Daniel Wagner, a scientist with the Papahānaumokuākea Marine National Monument, gingerly removes a deep coral from the collection basket on the Deep Discoverer remotely operated vehicle. Image courtesy of Art Howard/NOAA Office of Ocean Exploration and Research, 2015 Hohonu Moana. Download larger version (768 KB). 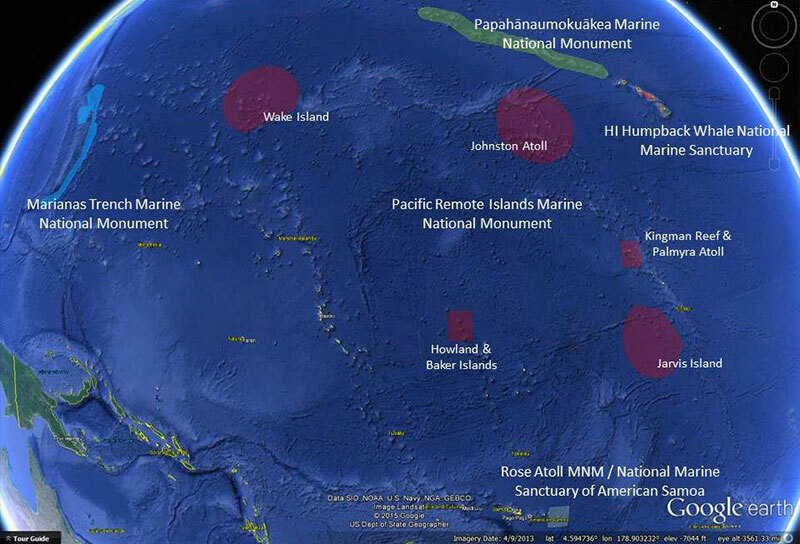 In July 2015, a team of NOAA and partners initiated the ‘Campaign to Address Pacific monument Science, Technology, and Ocean NEeds (CAPSTONE)’. CAPSTONE is a major multi-year foundational science effort focused on deepwater areas of U.S. marine protected areas in the central and western Pacific. The investment provides timely, actionable information to support decision making based on reliable and authoritative science. It also serves as an opportunity for the nation to highlight the uniqueness and importance of these national symbols of ocean conservation. As with all Okeanos Explorer expeditions, telepresence technology will allow anyone to follow CAPSTONE expeditions online in real time. All data collections are freely accessible from NOAA within 60 days of collection. Why Pacific Marine Protected Areas? The central and western Pacific marine national monuments and national marine sanctuaries encompass over 742,000 square miles of emergent land, coral reef, ocean, and maritime heritage resources. They contain some of the last relatively pristine marine ecosystems on the planet and harbor numerous protected species, as well as undiscovered shipwrecks and cultural landscapes sacred to the indigenous peoples of the Pacific. Their designation is unprecedented in terms of geographic scope, ecological value, and national symbolism for ocean conservation. However, their remoteness creates substantial challenges. Most deep-water areas remain poorly known and are of high interest to federal and state agencies with research and management responsibilities. 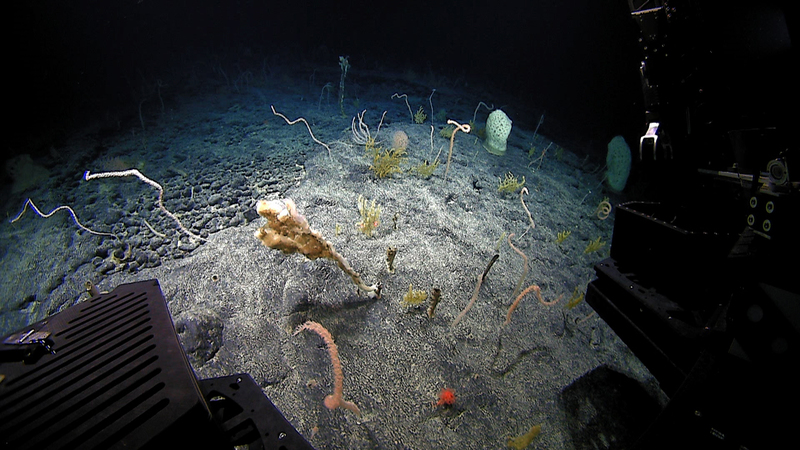 View from Deep Discoverer of a deep coral and sponge community along the Northampton Seamount Ridge, seen during the 2015 expedition. Image courtesy of the NOAA Office of Ocean Exploration and Research, 2015 Hohonu Moana. Download larger version (1.1 MB). The Campaign will provide a foundation of publicly accessible baseline data and information from U.S. marine protected areas in the central and western Pacific. The effort will also provide critical information relevant to emerging regional issues like deep-sea mining and the potential U.S. Extended Continental Shelf. Increase understanding of deep-sea biogeographic patterns across the Central and Western Pacific. Google Earth image of the U.S. marine national monuments and national marine sanctuaries in the central and western Pacific. These are the primary geographic areas of CAPSTONE operations between 2015 and 2017. Download larger version (291 KB). July - September 2015: The Hohonu Moana: Exploring the Deep Waters off Hawai’i expedition includes four separate cruise legs. Field work is focused along the Hawaiian Archipelago - including the Papahānaumokuākea Marine National Monument (PMNM) – and the Johnston Atoll region of the Pacific Remote Islands Marine National Monument (PRIMNM). February – September 2016: Campaign field activities will focus primarily in the western Pacific. We anticipate significant effort in and around the Marianas Trench Marine National Monument, the Wake Island portion of PRIMNM, and additional work in PMNM. October 2016 – September 2017: Field activities will shift back to the central Pacific and likely include areas extending from the vicinity of the Hawaiian Archipelago south to the equator. Priority areas include Kingman Reef and Palmyra Atoll, Jarvis Island, Howland and Baker Islands, and the Johnston Atoll portions of PRIMNM; the National Marine Sanctuary of American Samoa; and Rose Atoll Marine National Monument. Additional work in the Phoenix Islands Protected Area (PIPA) and Musicians Seamounts is also under consideration. *All 2016 and 2017 plans are dependent upon Fiscal Year 2016 and 2017 budget appropriations. For more information about 2016 and 2017 CAPSTONE plans or to discuss potential regional partnerships please contact Chris Kelley at ckelley@hawaii.edu and Jeremy Potter at jeremy.potter@noaa.gov. For details on how to get involved with Okeanos Explorer activities, please visit this page.